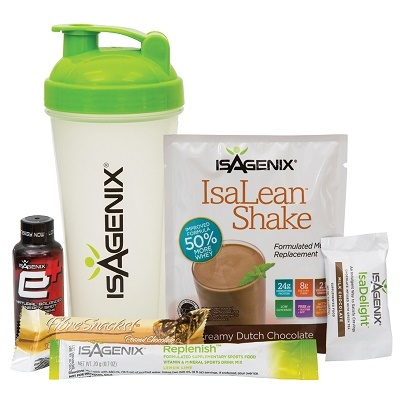 Isagenix Sample Pak - Sample Most Popular Products for Just $20! The Isagenix Sample Pak is a great introduction to Isagenix’s suite of healthy living solutions and an excellent way of helping new prospects discover their favourite products. With products ranging from IsaLean Shakes to Replenish lemon lime flavoured sachets, it makes a terrific gift for those with a passion for healthy living as well. What’s in the Isagenix Sample Pak? Perfect for mixing up IsaLean Shakes and other healthy, tasty concoctions, the IsaShaker is an obvious product to include in the Sample Pak and one that will serve you well for months, if not years, of healthy living. Available in deliciously creamy Dutch chocolate and designed to provide your body with the very best nutrition, IsaLean Shakes are a staple in thousands of households across the world. The single-serve shake can be quickly mixed up and enjoyed at work, at the gym, or anywhere else. Simply mix it with water right in your IsaShaker and enjoy one of the tastiest and most filling meal replacement shakes on the market. Each shake is designed to act as a complete meal replacement and contains 24 grams of high-quality protein, eight grams of easy-to-digest dietary fibre, active enzymes for easy digestion, and over 20 vitamins and minerals. Like other Isagenix products, they’re also low glycemic and soy- and gluten-free. With an appealing flavour as well, IsaLean Shakes are both delicious and nutritious. Made to be nutritious and satiating, IsaLean Shakes are ideal for anyone interested in healthy living or wanting to lose weight. It takes less than a minute to whip up each delicious shake and feel full for hours. The Sample Pak provides you with an ideal introduction to these popular shakes, but be prepared to order more once you experience just how tasty, healthy, and satiating IsaLean Shakes can be. IsaDelight may look like mere chocolate, but each square of deliciously satisfying dark chocolate is loaded with amino acids, antioxidants, minerals, and B vitamins, helping to satisfy your cravings and provide you with a mental and physical boost. With 210 kJ of energy per square, IsaDelights are tasty treats that will make you want to go the extra mile, not lay on the couch. When snacked alongside IsaLean Bars and Isagenix Fibre Snacks Bars, you’ll have plenty of variety and healthy snack options to choose from. The Isagenix Sample Pak also comes with a milk chocolate Fibre Snacks Bar to satisfy your hunger and cravings in a healthy, slimming way. That’s right; you can curb those weight-inducing cravings by enjoying six grams of protein and 24 percent of your recommended fibre allowance all wrapped up in a tasty milk chocolate snack! The Fibre Snacks Bar is the perfect complement to your Isagenix program and will likely become part of your normal healthy diet, helping you look and feel amazing while still indulging your sweet tooth. The Isagenix e+ Energy Shot utilises healthy botanicals, yerba mate, and green tea to provide you with an instant energy boost for everyday tasks and improved performance in the gym. Best of all, each Isagenix e+ Energy Shot is tasty and only contains 35 calories, allowing you to enjoy a guilt-free energy boost whenever you want, even on cleanse days. Formulated to help provide sustained performance and promote faster post-workout recovery, the Isagenix Replenish Stick is a sports drink mix packed with electrolytes for optimum hydration. You can drink it during a workout, afterwards, or sip on it throughout the day for superior hydration and increased energy. As you can see, the Sample Pak has nearly everything you need to introduce yourself and others to Isagenix’s unique products and business opportunity. Enjoy! For more information about this sample pack or any of the products in general, contact Nicole at info@isaelite.com.au or call her on 0413 254 398. How Can You Buy the Isagenix Sample Pak?